I have made a jotform and am trying to upload into Weebly but it will not post. 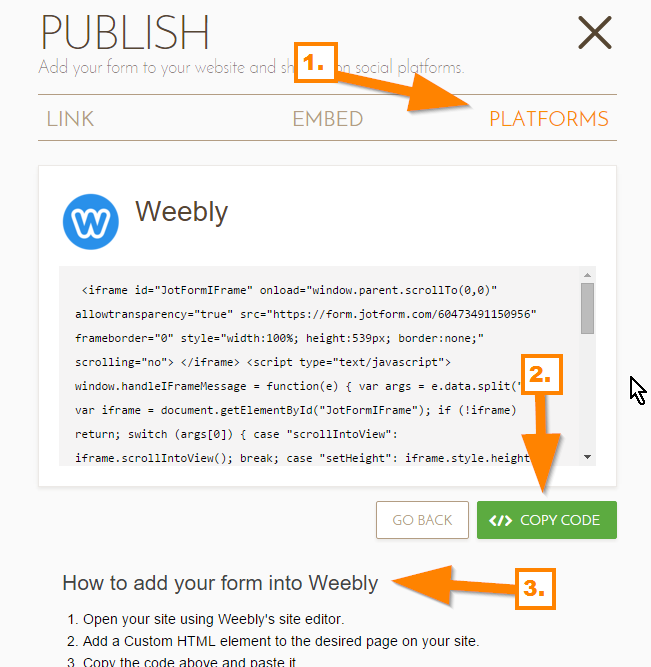 Have you tried following this guide on how to publish your form in Weebly: http://www.jotform.com/help/215-Adding-a-Form-to-Weebly? You can also find the instruction under the "Platform" section in your "Publish" wizard, just search for "Weebly". If that does not work, please do share to us the website page where you have embedded your form and we'll check it further. The new JotForm App for Weebly helps you add, create and manage forms and form submissions directly from Weebly.